In Britain during the immediate aftermath of WW1 there were several charities looking after the interests of ex-servicemen, these were the ‘National Association of Discharged Sailors and Soldiers’, the ‘National Federation of Demobilised Sailors and Soldiers’ the ‘Comrades of the Great War’, and the ‘Not Forgotten’. In 1919, Field Marshal Douglas Haig took an interest in this growing movement and these organisations were bought together within a new charitable organisation called the British Legion. The Legion was founded as a charity in 1921, to give aid to ex-servicemen of the rank and file. At this point there was no unified or state ceremony of remembrance of the war. The British Government hopes the event will become historic in the annals of the Empire and be a day of honourable pride and grateful remembrance rather than one characterised by grief and mourning. The governments of the Commonwealth were informed of this plan and the British Government expressed the hope that the observance of Armistice Day would be performed in such a manner as will best correspond with the conditions of each country and locality. This day of remembrance was simply called Armistice Day. The sale of the Flanders Poppy was not part of this plan, it was an entirely separate development. The British Legion and the United Services Fund 1919-1921. As a charity, the British Legion was in receipt of significant funding from the United Services Fund. This fund was established to administer the surplus profits of the canteens run by the Expeditionary Forces and the Navy and Canteen Board and by 1918 it had a total fund of £7,250,000, within a year ‘with interest and sales of securities’, it had grown to £10,000,000. The United Services Fund distributed money in the form of grants to the British Legion, who in turn distributed it to servicemen and their families through its ‘Relief Fund’. In the aftermath of the war, the care of ex-servicemen by the British government was inadequate, and the remit of the British Legion was to use the United Services Fund in combination with other fundraising efforts to support the men and their families. Essentially, the significantaid distributed by the Legion came from the servicemen themselves, through the profits of the canteen system that operated throughout the British theatre of war during 1914–18. The origin of the red poppy as a symbol of remembrance was the inspiration of an American woman, Moїna Michael who was in Paris in 1918 and she penned a form of reply to McCrea’s poem ‘We Shall Keep the Faith’. On 4 December 1918, the poppy was formally adopted as an emblem at ‘the 28th Conference of YMCA Overseas Secretaries, Columbia University, New York City. 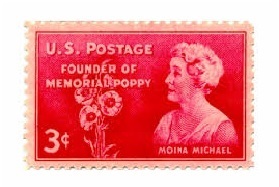 In the USA, Moїna Michael began a campaign to raise money for ex-servicemen, and she organised the manufacture of poppies which were sold to raise money for the American Legion. Madame Anna Guérin’ a Frenchwoman and a founder member of the ‘American and French Children’s League’ spent the war years in the USA raising money for French children. She became involved with the American Poppy campaign and in October 1919, was involved with the manufacture of 10,000 silk poppies in Baltimore’ Maryland. Back in France, Madame Guérin began to manufacture poppies made with silk, and mercerised lawn (cotton)’. She employed war widows, children and war veterans to make the poppies’ with the proceeds used to give aid to French ex-servicemen and their dependants. In August 1921, Guérin travelled to London with samples of her poppies and ‘invited the British Legion to adopt the idea, as a method of raising money for their own needs’. She told the Legion ‘that there were two firms in France that could make the poppies, and in return, she asked for a certain percentage of the profits for the French organisation’. The newly formed British Legion, and Field Marshal Haig, accepted her terms and immediately a short and intensive sales campaign was instigated to sell as many poppies as possible by the commemoration of Armistice Day. The publicity campaign for the poppy campaign centered on the pain and suffering of rank and file ex-servicemen and their families. The sales campaign, in The Times noted. Field Marshal Haig is anxious that November 11 should be a real Remembrance Day. He is proposing to launch several schemes in aid of his appeal for ex-servicemen of all ranks. One of these is the wearing of a Flanders Poppy as a sign of remembrance and reverence to the many thousands of our heroes who rest in peace beneath this flower in Flanders fields. John McCrea’s poem was central to the poppy campaign, and the flower was renamed the ‘Flanders Poppy’. Initially called the ‘Flanders Poppy campaign’ it was officially renamed the Earl Haig Fund, while the term ‘Poppy Appeal’ became the colloquial term. Within a six-week period, the British Legion linked the launch of the Flanders Poppy with the inaugural observance of Armistice Day and effectively created a potent symbol that personified Flanders, saturated with the blood of millions of young men. The poppies imported from France were priced at one shilling for a silk flower and three pence for one made from cotton. In addition, the British Legion hurriedly published a pamphlet called Poppy Day, that contained an appeal from Field Marshal Haig to the public ‘to purchase the poppy on behalf of all ex-servicemen and their dependants’. The populace was given special instructions on how to conduct the day. It is expected that a wreath of poppies will be laid on every war memorial … At 10 o’clock on Armistice Day a car will appear in each village, and representatives of the county families will gather together, to pay tribute to the fallen … All will be able to buy a Flanders Poppy, and at 11 o’clock, a wreath will be placed on the village cross, and the two-minute silence observed. The objective of the poppy campaign was to draw an emotional response from the public to the terrible human losses of the war, and thereby collect money for the survivors. The sales pitch for the Flanders Poppy was two-pronged, the purchase of a poppy gave aid to the widows and children of French soldiers, and the money raised by the British Legion would help to alleviate distress among British ex-servicemen. By 11 November 1921 the build-up to the sale of the Flanders Poppy generated a tsunami of emotion throughout Britain as virtually overnight it apparently became a duty to buy a poppy. Accounts of the first Armistice Day remembrance ceremonies and the Poppy Appeal are peppered with the imagery of blood. Soon after 10 o’clock Lady Haig drove into Regent Street. Her car was starred with scarlet flowers, which soon were plucked and sold … and then she and Lord Haig motored to some of the principle sales centres in London, and visited the city. They found it scarlet. The inaugural Armistice Day remembrance of 1921 combined with the sales campaign of the Flanders Poppy created a formidable, emotional tone throughout Britain as cities, towns, villages, and hamlets were encouraged to build a local cenotaph, in association with the new local British Legion clubs. After November 1921, the Flanders Poppy was firmly established as the symbol of the blood sacrifice of the millions of men who died during the WW1. 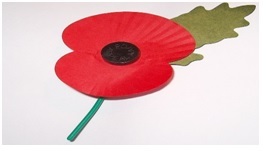 By 1922 the British Legion had registered the symbol by patent, and claimed total ownership of the poppy symbol. The Legion opened a factory to make the poppies, and employed men who had been disabled in the war, this enabled the Legion to keep all profits. Like the wayside Calvary in Catholic countries, the war memorial became the touchstone of one of the things that was held in common by Britons, a shared myth of mud, poppies and puttees with which to surround the smiling young faces in family photograph albums, and the letters tied in ribbon. Whatever the political differences and social frictions, Remembrance Day was, for decades, the moment at which people and nation fused. Graham Wootton, The Official History of the British Legion. Graham Wootton, The Official History of the British Legion. P.10. Malcolm Smith, ‘The War and British Culture’, pp. 171–2.